Shoppers' Choice Awards names Closet Tec, Inc. as the BEST DEALS 2019 Winner. The Sarasota Herald Tribune announces Closet Tec, Inc. as Readers Choice 2018 Best Murphy Bed Company. 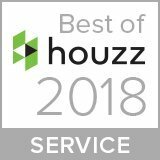 Houzz awards Closet Tec, Inc. with the Best of Houzz 2018 award for service. It’s official — People on Yelp love Closet Tec Inc! Yelp sent us a coveted “People Love Us On Yelp” sticker in the mail and we can't wait to display it proudly. Closet Tec featured in the Sarasota Herald Tribune for its new Closet Tec Young Designer Scholarship. Closet Tec, Inc. proudly earns its status as an A+ rated BBB accredited business at the end of 2016. The Sarasota Herald Tribune announces Closet Tec, Inc. as the winner for the sixth consecutive year of the Readers’ Choice Awards for Best Closet Company in both Sarasota and Manatee. Closet Tec, Inc. proudly earns its status as an A+ rated BBB accredited business at the end of 2015. The Sarasota Herald Tribune announces Closet Tec, Inc. as the winner for the fifth consecutive year of the Readers’ Choice Awards for Best Closet Company. The Sarasota Herald Tribune announces Closet Tec, Inc. as the winner for the fourth consecutive year of the Readers’ Choice Awards for Best Closet Company. The Sarasota Herald Tribune announces Closet Tec, Inc. as the winner for the third consecutive year of the Readers’ Choice Awards for Best Closet Company. The Sarasota Herald Tribune announces Closet Tec, Inc. as the winner of the Readers’ Choice Awards for Best Closet Company. Closet Tec Designer Wallace Smith Wins Honorable Mention Award in Closet Daily Magazine’s Top Shelf Award for Master Closet category in Sarasota, FL. The Sarasota Herald Tribune announces Closet Tec, Inc. as the winner of the 2019 Readers’ Choice Awards for Best Closet Company in Sarasota, Venice, and Manatee. Closet Tec, Inc. proudly earns its status as an A+ rated BBB accredited business at the end of 2017. Angie's List awards Closet Tec, Inc. with the super service award. The Sarasota Herald Tribune announces Closet Tec, Inc. as the winner for the seventh consecutive year of the Readers’ Choice Awards for Best Closet Company in Sarasota. Houzz awards Closet Tec, Inc. with the Best of Houzz 2017 award for service. Over 500 Houzz users have reached out and saved our work in their Idea Books. Houzz awards Closet Tec, Inc. with a Best of Houzz Award for 2016 in customer satisfaction. Houzz honors Closet Tec Inc. as a recommended closet design company in September. Houzz awards Closet Tec, Inc. with a Best of Houzz Award for 2015 in customer satisfaction. Houzz awards Closet Tec, Inc. with a Best of Houzz Award for 2014 in customer satisfaction. The Sarasota Herald Tribune announces Closet Tec, Inc. as the winner for the second consecutive year of the Readers’ Choice Awards for Best Closet Company. Closet Tec Designer Kirk McQuay Wins Honorable Mention Award in Closet Daily Magazine’s Top Shelf Award for Reach-in Closet category, Sarasota, FL.